Saxenda is a weight loss medication that works as an appetite suppressant. As well as helping patients lose weight, the medication appears to improve many indicators of cardiovascular risk. Can I buy Saxenda online? Saxenda (Liraglutide) is available to prescribe in the UK via The Online Clinic. If you complete one of our online medical questionnaires, we can then consider you for this medication. Saxenda (Liraglutide) is available for next day delivery. Saxenda contains the active ingredient: Liraglutide. Lirgalutide is a Glucogon-Like Peptide-1 (GLP-1) analogue. GLP-1 is produced naturally in the human body and Liraglutide is a synthetic version of that natural version with 97% amino acid sequence similarity. Natural GLP-1 is produced in the body in response to food consumption. In the simplest terms, GLP-1 is a messaging system to tell our bodies that no more food is required. By delivering Liraglutide via a simple injection on a daily basis, that messaging system is activated, and we will feel less desire to eat and we will be satisfied with less food. Reduced food consumption should lead to weight loss. Saxenda (Liraglutide) is a daily injection using a very easy to use, dose-adjusted pen that is pre-filled with the medication. All you have to do is set the dial to the correct dosage and inject under the skin of the abdomen. The starting dosage for Liraglutide is 0.6 mg per day. You inject the medication at the same time each day, so choose a time that will always be convenient for you (we recommend the morning). The maximum dosage is 3.0 mg per day, but you must follow the dosing and titration instructions to minimise the risk of side effects. Full instructions are sent with the medication and we provide a helpful video demonstration for all patients after purchase. If you are prescribed this medication via The Online Clinic, we are on hand to answer any questions you may have about your Saxenda pen. You will also be given access to Weight Journey , a website supported by the manufacturer of Saxenda, to assist you with your weight loss programme. All medications have the potential for side effects but Liraglutide is remarkably well tolerated if taken as directed. Some people experience a little nausea to begin with, but most people find that this dissipates with continued use. Other side effects include indigestion and diarrhoea. A full list of side effects is included on the patient information leaflet, which we make available to patients prior to a purchase. Most people do not get any side effects at all (other than minor nausea at dose increases). Clinical studies have shown Liraglutide to be a highly effective and safe weight loss agent, with people losing clinically significant levels of weight at both the 1.8 mg dose and the 3.0 mg dose. In addition, blood pressure was reduced and there was a marked reduction in levels of C-Reactive Protein (an inflammatory marker associated with cardiovascular risk). Around 65% of patients will achieve meaningful weight loss with Saxenda. 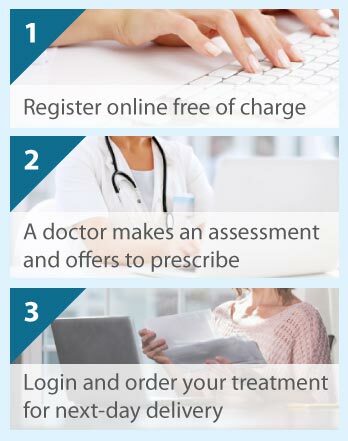 You can apply for a prescription for Liraglutide through The Online Clinic today using the Free Consultation button on this page. Medications are available for next day delivery anywhere in the UK. You may see Saxenda advertised as SkinnyJab or SlenderPen. Please note that these are the trademarks of clinics rather than the product itself. The Online Clinic has no association with these brands.